"A stylish and interesting puzzle game, can you escape from this nightmare?" 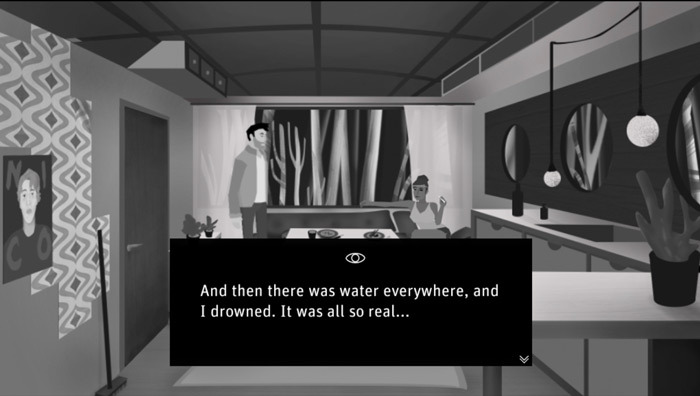 Awake is a great looking noir styled game that combines the black and white stylings of a film noir with cartoon like but beautiful visuals. 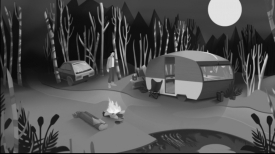 You are on a camping trip with your girlfriend and everything seems fine until you get stuck in a time loop which ends each time with you being murdered and then you wake up only to relive the whole situation again but by collecting objects and items it may be possible to break out of the loop and stop yourself from being killed but it will take many tries and trying lots of different things to try to break the loop and release yourself from this never ending nightmare but it’s a lot fun trying to do so and with the graphics looking so great you certainly will not get tired of the animation also there may be a lot more to the story than perhaps you just being repeatedly murdered over and over again. Awake was built for a game jam in the course of just 14 days and looks stunning, it is also a different and unique game and one that will appeal highly to people that enjoy problem solving and playing detective. You can download Awake here for free.